In one of our previous health tips, we talked about what a prescription medication is: any medication that strictly requires a doctor’s prescription before a pharmacist can dispense it to you. Normally, a doctor will ask you several questions before prescribing a medication for, let’s say, hypertension or diabetes. Some of these questions include the drugs you are currently taking, whether you have reacted to any drugs before and which ones, including the one he or she is about to prescribe for you. It may sound irrelevant, but a lot of people don’t bother to check the expiry date of drugs before paying for them at the pharmacy. Taking an expired drug is harmful in any way you can imagine: such a drug has lost its potency to treat the condition you’re taking it for, meaning a waste of money, and it may even now cause a serious health problem for you. Therefore, ensure you inspect the packs of the drugs you’re buying at any pharmacy before paying for them. If you can’t find the expiry date on the pack request for another one. For drugs that may be dispensed into a pill bottle or a sachet, ask the pharmacist about their expiry dates on the dispensing container. It is your fundamental human right to know the expiry date of any medication you’re buying. If you encounter resistance, just walk away and look for another pharmacy. Again, many people take this for granted. Whenever you purchase any prescription medication, ensure you go through the leaflet inside the pack. Don’t throw it away immediately. Look out for where all the possible side effects of the drugs are written and take note of them. 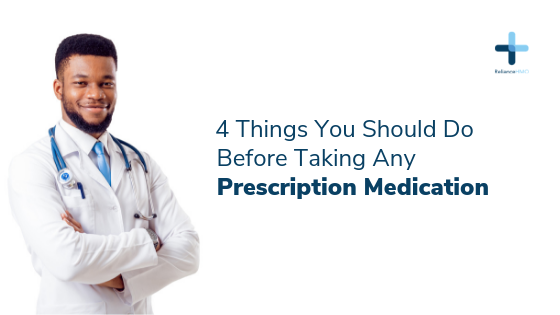 While your doctor will definitely tell you the very common side effects of any medications he or she prescribes for you, there are less common ones that time may not permit him or her to inform you about. But they are written on that leaflet. Going through the leaflet for these less common and often very dangerous side effects will enable you know and attribute any one of them to the drug at once if you experience any, thereby stopping the medication right away. And it will prevent you from wrongly blaming another thing for such a side effect while still taking the medication which could be very dangerous. This precious information is also printed on the leaflet of any prescription medication you purchase. Drug interactions means other drugs and even foods and drinks that interact with the medications you’re taking in ways that make them either less effective or very harmful to your body. Hence, such drugs, foods and drinks should be avoided while on the particular medications prescribed for you. Read about the contraindications of the drugs. On that same leaflet, you will find information on the contraindications of the medication. Contraindications of a drug are health conditions and situations in which such a drug should not be taken or a doctor should be consulted for guidance on taking them. For instance, someone with a liver or kidney disease is not supposed to take any medication whose common side effect is injury to any of these organs. When there are no alternatives as is the case for some first-line drugs for treating tuberculosis, such a person will take the drugs in dosages recommended by a doctor and will constantly be monitored for signs of injury to these organs. Pregnancy, asthma, diarrhoea and so on are conditions (contraindications) that warrant certain drugs to be avoided or be taken under the strict guidance of a doctor. Your doctor will always ask you if you have any of these conditions that are contraindications before giving you a prescription. However, he or she may not ask you for all the possible conditions, and reading that leaflet can be a lifesaver.